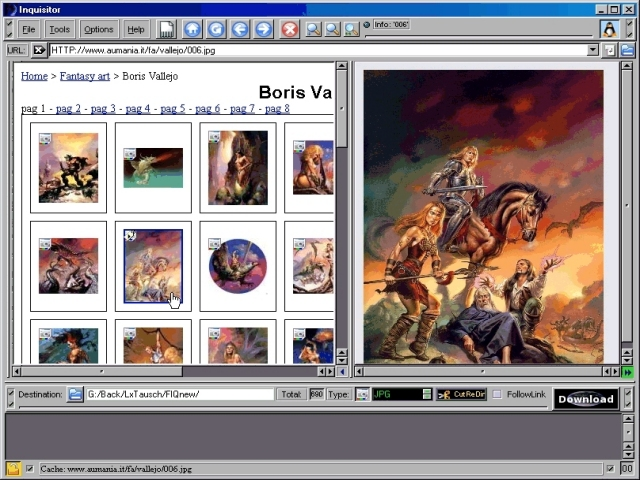 Inquisitor is a fast, save, visual Picture Site Ripper / Offline Browser to select and download images shown as thumbnails directly from a displayed website in a specified destination directory. It also includes a multi connect ftp-client, and a local FileManager like "NortonCommander", and the possibility to display captured websites with "Infiltrator-Mode" ! Also includes a HTTP scanner. No dangerous HTML/Java Code will executed, even on a Windows System. Includes a very save HTML interpreter. Works in German or English and is available for Windows and Linux.